The reaction in the late 19th century against naturalism in art led to a sequence of different movements in the 20th century. In each of these periods of innovation Pablo Picasso played an important part. He said that to repeat oneself is to go against “the constant flight forward of the spirit.” Primarily a painter, he also became a fine sculptor, engraver, and ceramist. 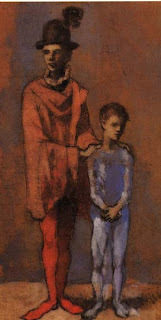 Pablo Ruiz y Picasso was born on Oct. 25, 1881, in Málaga, on the Mediterranean coast of Spain. His father, an art teacher, early recognized his son's genius. Picasso studied at the Academy of Fine Arts in Barcelona, where his father was appointed professor in 1896. Pablo had already mastered realistic technique, however, and had little use for school. At 16 he had his own studio in Barcelona. In 1900 he first visited Paris, and in 1904 he settled there. Picasso's personal style began to form in the years from 1901 to 1904, a period often referred to as his blue period because of the pervasive blue tones he used in his paintings at that time. In 1905, as he became more successful, Picasso altered his palette, and the blue tones gave way to a terra-cotta color, a shade of deep pinkish red. At the same time his subject matter grew less melancholy and included dancers, acrobats, and harlequins. The paintings he did during the years between 1905 and 1907 are said to belong to his rose period. In 1907 Picasso struck off in an entirely different direction with Les Demoiselles d'Avignon. This painting shows the influence of his new fascination with primitive art and carvings, especially those of African origin. 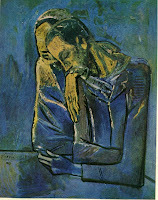 The picture represents a major turning point in art because it opened the door to cubism and the later abstract movement. Working with his friend and fellow painter Georges Braque, Picasso began experimenting with increasingly analytical and geometric forms. His painting The Three Musicians, which dates from 1921, is one of his major achievements using this technique (see painting). In 1917 Picasso had gone to Rome to design costumes and scenery for Sergey Diaghilev's Ballets Russes. This work stimulated another departure in Picasso's work, and he began to paint the works now referred to as belonging to his classic period, which lasted from about 1918 until 1925. 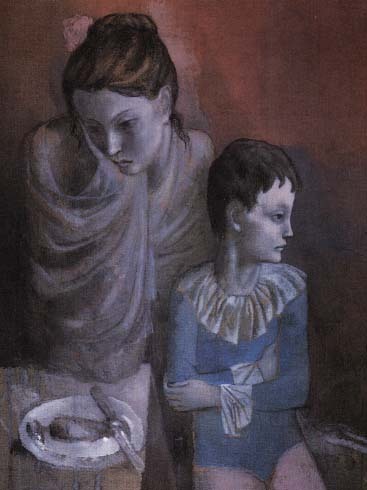 At the same time he was working on designs for the ballet, Picasso also continued to develop the cubist technique, making it less rigorous and austere. By the time he painted Guernica, his moving vision of the Spanish Civil War, the straight lines of early cubism had given way to curved forms. This huge painting, considered by many to be his masterpiece, was Picasso's response to the 1937 bombing by the Fascist forces of the small Basque town of Guernica. He completed this emotional political statement in the same year. In it, as in many of his later pictures, distortions of form approach surrealism, but Picasso never called himself a surrealist. From about 1904, shortly after he settled in Paris, until 1911, Picasso had lived with Fernande Olivier, who may have inspired the sunnier outlook reflected in his rose period. From about 1911 until her death in 1917, he lived with Marcelle Humbert. In 1918 Picasso married a young Russian ballerina, Olga Koklova. The couple, who later separated and were divorced in 1935, had one son, Paulo. Olga died in 1955. In 1961, at the age of 80, the artist married his model, Jacqueline Roque. In the time between these two marriages, Picasso shared his life with several women who influenced his work and provided him with a family. His mistresses included Marie-Thérèse Walter, whom he met in the early 1930s and who was the mother of his daughter Maia, and Dora Maat, a Yugoslavian whom he met in 1936. Françoise Gilot, who lived with Picasso between 1946 and 1953, was the mother of his youngest children—Claude, born in 1947, and Paloma, born two years later. His association with Gilot inspired Picasso to create a charming series of paintings that featured a mythologically inspired world of fauns, nymphs, centaurs, and pipers. 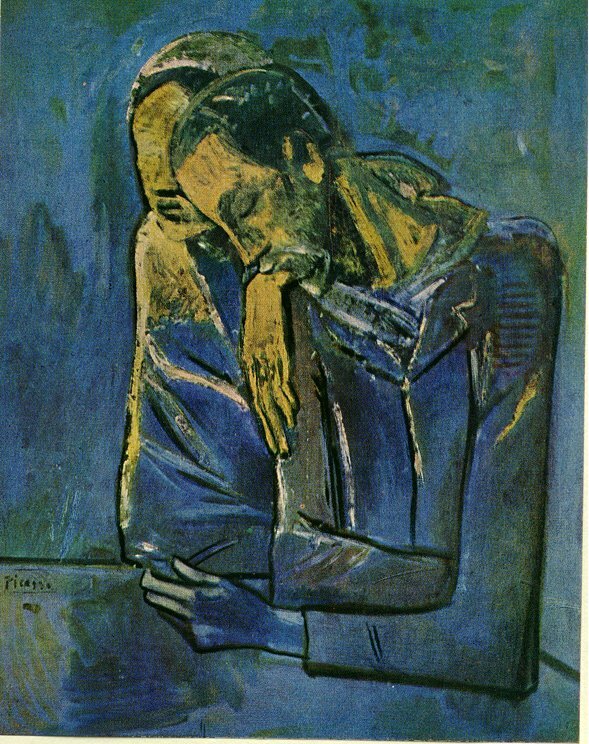 Picasso remained in France throughout World War II, but he was forbidden to exhibit his work after the German occupation. He joined the French Communist party in 1944. In 1955 he moved to the French Riviera. Picasso continued to work with incredible speed and versatility—as painter, ceramist, sculptor, designer, and graphic artist—into his 90s. The value of his estate was estimated at more than 500 million dollars when he died on April 8, 1973, in Mougins, France. La reacción en el siglo 19 contra el naturalismo en el arte desarrollo una secuencia de movimientos diferentes en el siglo 20. En cada uno de estos períodos de innovación Pablo Picasso desempeñó un papel importante. Picasso decía que para respetarse a uno mismo hay que ir en contra de "la constante huida hacia adelante del espíritu." Ante todo un pintor, también se convirtió en un escultor, grabador y ceramista. Pablo Ruiz y Picasso nació el 25 de octubre de 1881, en Málaga, en la costa mediterránea de España. Su padre, un profesor de arte, noto la genialidad de su hijo. Picasso estudió en la Academia de Bellas Artes de Barcelona, ​​donde su padre fue nombrado profesor en 1896. Pablo dominaba la técnica realista, sin embargo, no fue valorado en la academia. A los 16 años tuvo su propio estudio en Barcelona. En 1900 visitó por primera vez París, y en 1904 se estableció allí. 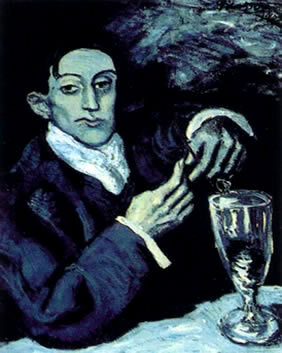 El estilo personal de Picasso comenzó a formarse en los años 1901 a 1904, un período al que se refiere a menudo como su periodo azul, debido a los tonos de azul penetrante que utiliza en sus pinturas de la época. En 1905, ya que tuvo más éxito, Picasso cambió su paleta, y los tonos azules dieron paso a un color terracota, un tono de rojo rosado profundo. Al mismo tiempo, su tema creció bailarines menos triste e incluyó, acróbatas y arlequines. Las pinturas que hizo entre los años 1905 y 1907 se dice que pertenecen a su periodo rosa. En 1907 Picasso sacudió en una dirección completamente diferente con Les Demoiselles d'Avignon. Esta pintura muestra la influencia de su nueva fascinación con el arte primitivo y las tallas, especialmente las de origen africano. La imagen representa un importante punto de inflexión en el arte, ya que abrió la puerta con el cubismo y el movimiento abstracto más tarde. Trabajar con su amigo y también pintor Georges Braque, Picasso comenzó a experimentar con formas cada vez más analítica y geométrica. Su pintura Los Músicos, que data de 1921, es uno de sus mayores logros con esta técnica. En 1917 Picasso había ido a Roma para diseñar vestuario y la escenografía para Russes Sergei Diaghilev. Este trabajo estimuló otra salida en la obra de Picasso, y comenzó a pintar las obras que ahora se conoce como pertenecientes a su periodo clásico, que duró desde 1918 hasta 1925. Al mismo tiempo estaba trabajando en los diseños para el ballet, Picasso también continuó desarrollando la técnica cubista, por lo que es menos rigurosa y austera. En el momento en que pintó "El Guernica", su visión conmovedora de la Guerra Civil Española, las líneas rectas del cubismo temprano había dado paso a formas curvas. Este enorme cuadro, considerado por muchos como su obra maestra, fue la respuesta de Picasso a los bombardeos de 1937 por las fuerzas fascistas de la pequeña ciudad vasca de Guernica. Completó esta declaración política emocional en el mismo año. En ella, nunca como en muchas de sus fotos más tarde, las distorsiones del surrealismo forma enfoque, pero Picasso se llamó a sí mismo surrealista. 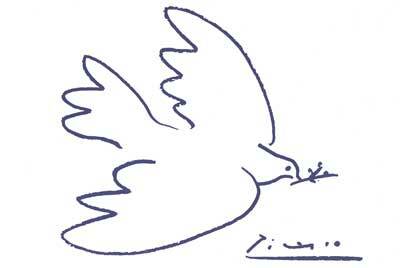 Picasso permaneció en Francia durante la Segunda Guerra Mundial, pero se le prohibió exponer su obra después de la ocupación alemana. Se unió al Partido Comunista Francés en 1944. En 1955 se trasladó a la Riviera francesa. Picasso continuó trabajando con increíble velocidad y versatilidad, como ceramista, pintor, escultor, diseñador y artista gráfico, a sus 90 años. El valor de su patrimonio se estimo en más de 500 millones de dólares cuando murió el 8 de abril de 1973, en Mougins, Francia.